Editors Note: Since publishing this case study, Mincron Software Systems joined the Kerridge Commercial Systems (KCS) group. Mincron continues to offer its successful ERP solution with a choice of deployment options, ranging from SaaS and cloud to traditional on-premises deployment. Mincron Software Systems, based in Houston, Texas, is a full-service provider of complete wholesale distribution software systems. Mincron used LongRange and RPG code to build its StreetSmart series of native mobile apps that integrate with its IBM i-based ERP system. The first app, a customer service app was built in five days. 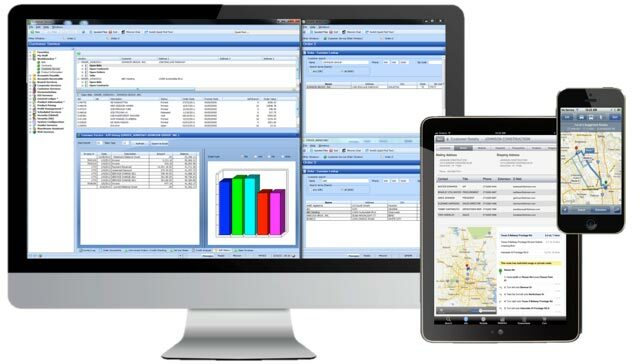 It allows travelling sales staff from companies using Mincron's ERP system to inquire into customers and products, use the GPS to Map their route to the customer, scan barcodes, enter sales orders and submit them for processing, view sales history in Google Charts, and more. Other StreetSmart apps for Proof of Delivery and Inventory Replenishment have since followed. Greg Johnson, team leader for new technology at Mincron, says "The quality and simplicity of LongRange and the tutorials that come with it are simply amazing. The number of examples that are provided along with the associated DDS and RPG have been of tremendous help. You can build an entire application doing nothing but copying the sample code and tweaking it a little. Truthfully, anyone who sees this product and how easy it is to use will fall in love with it. This should be ‘standard fare’ for anyone with an IBM i." The quality and simplicity of LongRange and the tutorials that come with it are simply amazing. Mincron is a leading provider of innovative, high-value software and business service solutions for wholesale distributors and logistics companies requiring tightly integrated enterprise software solutions. Over 15,000 users sign on to Mincron’s solutions each day from 2,000 locations across the USA and Canada. 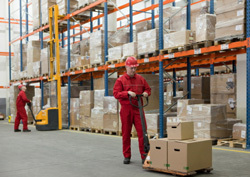 Most of Mincron's customers are wholesale distributors of hard-goods. Recently, Mincron modernized its ERP system, now called SmartDistributor, using RAMP from LANSA, providing a Windows rich-client user interface and a modern feature set while retaining and building further on the 3 million lines of RPG code. During the screen enhancement stage of this modernization project, one of the team members investigated the use of aXes Mobile. A simple mobile web application over Mincron's RPG-based ERP solution was created. The application was based on the typical travelling salesperson requirements from Mincron's customers, and it included a customer search, product search, order inquiry and order entry facility. The application was fully functional, but just meant as a prototype, so it was not handed over to quality control or customers. "It did lead to some interesting discussions about mobile apps internally and with customers, debating whether mobile apps should be web, native or hybrid," says Greg Neal, Mincron's director of product development. "Based on research and customer requirements, we formed the opinion that mobile web apps are fine for basic inquiry and update access to our ERP system, but for speed, reliability and integration with device hardware functions, we were inclined to go on the path of native mobile apps. For speed, reliability and integration with device hardware functions, we were inclined to go on the path of native mobile apps. At the time, the LongRange beta program had just commenced and Mincron was keen to be part of it. LongRange is a native mobile app builder and execution framework for IBM i programmers, specifically targeted at RPG and COBOL developers. Greg Johnson, team leader for new technology at Mincron, was put in charge of evaluating LongRange. Not quite knowing what to expect, Johnson assumed he would have to learn Objective C, Java or some other mobile development language. Neal and Johnson attended an introduction Webinar for LongRange. Barely 10 minutes into the Webinar, they were both surprised to discover that only RPG development skills were required. "I was preparing for a big learning curve and I was shocked and amazed at how easy it was with LongRange to create a native mobile app using just my existing RPG skills," Johnson says. Mincron purchased an iPad, downloaded the LongRange SDK and got the beta trial started. Johnson spent about two days going through the quick start guide and installing/examining the tutorial examples. These he found to be comprehensive and extremely useful. Lookup customers and link to the customer's website for news updates, etc. Display the customer's address in Google Maps with a red pin, and using the device GPS, display their own location with a blue pin. Press an icon to call the customer or send an sms. Search for products and access pictures and audio files that are attached to a product. Enter sales orders using a shopping cart function and send them for processing to the IBM i based ERP system using the current pricing for that specific customer. Use the device camera/scanner to scan barcodes and add the scanned products to the shopping card. View customer transaction history (bids, contracts, orders) and present them in multiple tables on a single page or in Google Charts. Use the 'corporate level resource folder' to view documentation the corporate office has published, such as sales specials and company announcements. Sales reps can also send messages to any other user on the host system as well as view messages sent. "It just blew everybody away that we could create such a mobile app using only our existing RPG skills in just five days," says Johnson. "It may sound as one of those too-good-to-be-true scenarios but, using the tutorial example code and some snippets of our own RPG code, it was really that easy." It just blew everybody away that we could create such a mobile app using only our existing RPG skills in just five days. Most of Mincron's customers are wholesale distributors of hard-goods, such as HVAC, plumbing, electrical and industrial products. "The tutorials and the documentation that come with LongRange are ridiculously good. The number of examples that are provided along with the associated DDS and RPG is amazing. You can build an entire application doing nothing but copying the sample code and tweaking it a bit," Johnson continues. "The level of detail the developers have gone through, not just to build the LongRange product, but also to document and build the examples, is priceless to people like me who need to get familiar with the product. It gives you a tremendous head start." "Let me say it one more time... truthfully, anyone who sees this product and how easy it is to use will fall in love with it. This should be ‘standard fare’ for anyone with an IBM i." The demand for Mincron's mobile app is huge according to Neal, illustrating it with the fact that Mincron has already signed up a first beta customer for its native mobile app, while Mincron is still a LongRange beta customer itself. One of the mobile apps that Mincron's beta customer wants is more or less what Johnson built as a prototype in just five days. You can build an entire application doing nothing but copying the sample code and tweaking it a bit. Johnson concludes, "Without LongRange it may have taken us weeks or perhaps months just figuring out how to get started on a mobile development project. And without the example code, our first app would have been far less functional." "Our sales team is very excited that we are the first ERP vendor to offer a truly integrated native mobile app to customers. As far as we know, none of our competitors in the ERP business can currently offer anything like this," concludes Neal. Our sales team is very excited that we are the first ERP vendor to offer a truly integrated native mobile app to customers.